I have another masculine card to share with you today. I enjoy making my own backgrounds and it helps because then the colors are a perfect match... which is not always easy for me since I have a mish mash of paper from all sorts of different companies. The background is made with ODBD Ocean Treasures and Sand Dollar Bookmark. Lots of sponging with Distress Inks Tea Dye and then sprinkled with drops of water. I stamped the anchor image in Versafine black and sponged in the sky and sand while keeping it in the Spellbinders Label 2 die. The anchor and rope were colored with Copics and I added a little anchor charm. What a lovely masculine card!! Great image and I love the background! Thanks for sharing with us at Word Art Wednesday this week! 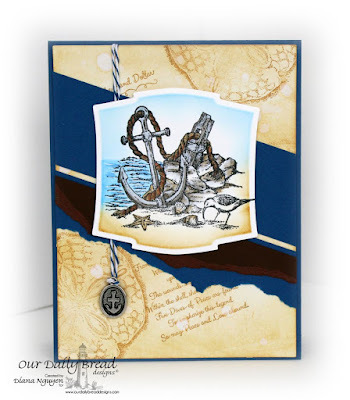 Love the sanddollars in the background, such a great design, Diana! Thanks for joining us at the Simon Says Stamp Wednesday challenge! The tea dye really makes it seem like a sea scroll from a bottle. Love it. Hi, Diana! I hope that you're having a GREAT week. I'm always so incredibly blessed to have you share your talents with us, and I SO love seeing your art. Thanks so much for sharing with us, and enjoy your week! This is gorgeous...I love the strong colors. What a blessing it is for us that you joined our Challenge last week. This week, our Challenge is still ongoing so, please stop by again and join us at Word Art Wednesday! Leaving you the blessing found in God's Word from Hosea 10:12 which says, "Sow righteousness for yourselves, reap the fruit of unfailing love, and break up your unplowed ground; for it is time to seek the LORD, until he comes and showers his righteousness on you." Hugs, always!